Supposedly, we spend about a third of our lives in bed. It’s no wonder, then, that things like mattresses and sleep trackers are such a thriving business. Just about everyone wants to get a good night of sleep, and that’s why products like Sleep Number beds and Nokia’s Sleep Sensing And Home Automation Pad ($100) are appealing. But do they really help you feel better rested? We put the Nokia’s Sleep Sensing Pad and accompanying app to the test to find out. Are you reading or sleeping? It knows. The Nokia Sleep Sensing and Home Automation Pad is an interesting concept. 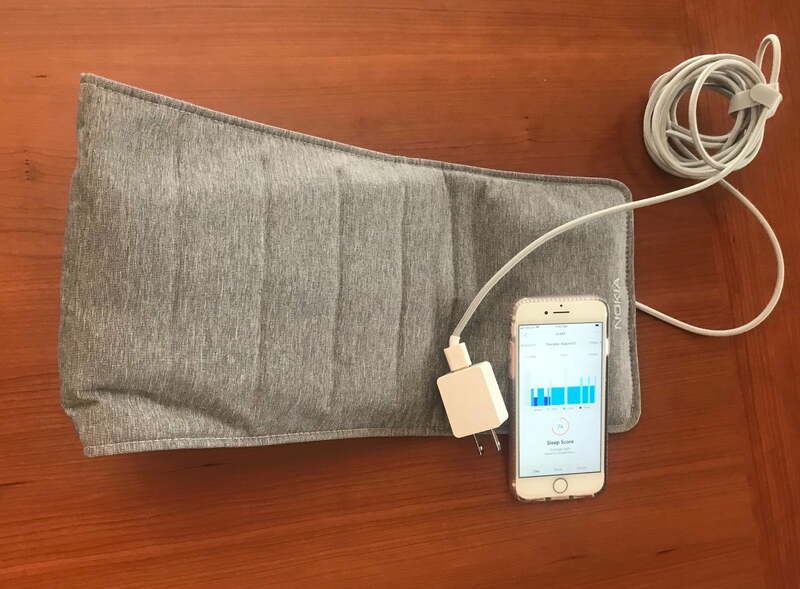 The unit is a soft gray mat with a sensor inside that you place under your mattress in line with where your chest rests on the bed. Throughout the night, the accompanying Health Mate app (available for iOS and Android) will record your slumber habits. Designed to work with other smart home IFTTT devices such as lights and thermostats, the aim of the product is to create a holistic sleeping experience. We found that we didn’t need to be in a smart home to make the most of the Nokia pad. The product can tell the difference between reading in bed and time spent sleeping. It can also tell when you got out of bed versus just restlessly tossing and turning. Best of all, the sleep sensing pad can detect snoring, including when you started and how long it lasted. Finally, something that can help you win the “I wasn’t snoring all night!” argument. Setting up the Nokia pad is, well, easier than falling asleep. Just plug the pad into the wall and place it in the proper spot under your mattress. Like many smart home devices, the pad and app talk to each other via a Wi-Fi network (it doesn’t work over a cellular data network). However, the first time you pair the phone with the pad, you need to do it via Bluetooth. Once the initial pairing is complete, Bluetooth doesn’t have to be activated on your phone to gather nocturnal readings. If you want to pair the device with another phone to monitor the sleeping habits of your significant other, it’s easy enough to reset and pair. The product can tell the difference between reading in bed and time spent sleeping. We used the pad and app to monitor our sleep for about a month, and overall, the results were fascinating. Each morning, you get a sleep score based on several factors, including your heart rate and the amount of tossing and turning you’ve done. The app also ties into the Health app on an iPhone, tracking your steps and tying that into your sleep data. In addition to recording your sleep cycles (REM, light, deep, and awake) and snoring incidents, it also tracks your heart rate throughout the night. There are other sleep tools in the app worth exploring. Over time, we could tell our sleep had improved based on some of the habit changes we made during the day. For example, on a day that we walked five miles, we not only received a restful night sleep score, but the heart rate reading was lower as well, which was a good thing. Here’s the real magic of this sleep assessment product: it’s a bit of a psychological game. As the old adage goes, “Attitude is everything.” On a night where we got a score of 63 (not good), we did feel noticeably more tired the next day. When we got a score of 99 (very good), we had plenty of energy for the day, and were generally in a delightful mood. The question is, did we feel like we had more energy because of our high score, or because we indeed had a restful night sleep? It’s hard to say, but regardless of whether we believed we got solid sleep or actually achieved solid sleep, we felt surprisingly energetic. The one quibble we did have with the device is that it didn’t always record snoring on a night when we were told there was plenty of snoring happening. Even that added a bit of a lift to our step, though, making us think that maybe the snoring actually wasn’t that bad, if the pad didn’t pick it up. The Nokia device included more detail and accurate readings than with sleep apps we’ve used before. But is it worth the $100 price tag? Overall, we did find the data gleaned from the Nokia sleep pad to be enlightening, and it motivated us to change our daily habits to see if our score improved. At a minimum, you might finally be able to prove just how much you or your significant other actually snores. Hey, isn’t that worth it?